The server change has caused some problems in the database of the forum that have emerged this afternoon. To avoid more problems we have disabled it time to solve these technical problems which we hope will last the shortest time possible. We will do everything possible to restore the database with the least possible loss of data for it. We present our apologies for any inconvenience. Update: The forum is now online and works completly. We had lost just some messages. 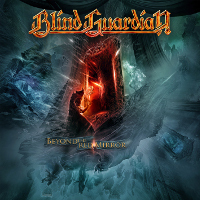 en.Blind-Guardian.fr's bootlegs section is open ! To continue to offer you the site the most complete, we have decided to create a section dedicated to the bootlegs of the band. Caution, this section is here purely for informational purposes only, we don't encourage you to by them, because remember this, there are illegal! This will allow you to distinguish these bootlegs of official releases. And, if your are not sure, you can always ask in our forum. 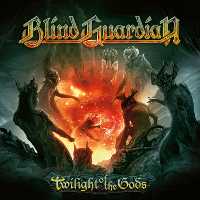 You can access this new section of the site via the menu "The Band", or directly by following this link: Section bootlegs of en.Blind-Guardian.fr. 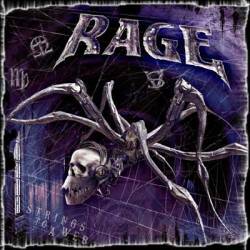 Hansi and Rage are long date friends, they works together in 2002 for the first time on the Rage's album Unity. In 2007, they meet again on the Nuclear Blast Allstars compilation and this year, Hansi was with the band on their Wacken Open Air show's for celebrating their twenty-fifth anniversary. Here they are together again in the Twilight Hall Studios (the recording studio of Blind Guardian) to work on Strings To A Web, the upcoming Rage's album. Hansi will appear on Empty Hollow, the main work of the album which which is an orchestral song of almost twenty minutes divided into five parts. Jen Majura, another old friend of Rage (and Blind Guardian because she made backing vocals on Sacred) will play also on this song, but she'll play didgeridoo ! All these great people together should give something quite exceptional and it will surely be very interesting to check it out that this new album will be available (certainly not before 2010). Hansi has issued a message to keep us abreast of the progress of the new album and themes that will be used for the lyrics. The last time I wrote something I promised to give the next update around Easter. Well, Easter season is a little late this year, but better late than never is my favorite saying. Here is my long promised message. To keep this one a short but essential one: we finally have started the production of Blind Guardian studio album number nine. Frederik is literally rushing through the songs already. Who knows, this time we may deliver the finished master prior to the ultimate deadline (set by an about-to-get-insane record company after thousands of broken promises to finally deliver the new record within the next days). Well Frederik isn't Marcus, who isn't André, who most certainly is not Hansi. So there still lies trouble (i.e. delays) ahead. Back to Frederik, back to the production: We started sometime last week and Frederik accomplished drums for some seriously tricky tracks. If I am correct he has two more tracks to go and should be finished during the next days. Altogether there are 11 songs to work on. As mentioned last time, we do have a strong amount of heavy Guardian hymns, which come along with such a harsh intensity that I am sometimes surprised myself. There is a fine balance of extremely fast songs and ultimate epic stuff. "Wheel of Time" would be one example for the last mentioned. The song contains many surprises - I am deadly honest about that, so mark my words here. Lyrically I am of course tempted to deal with Robert Jordan's great "Wheel of Time" story, one of the best fantasy series ever. If you asked me with which song the number could be compared I most probably would say "The Script for my Requiem" or "And then there was Silence". This tune does really have the potential to mess with these two songs. Recently German radio station WDR 2 had a big competition in which listeners could vote for the 200 best bands of all times. Blind Guardian came 121st ranking and WDR 2 chose a song very representative for the band... "Satisfaction" for the Rolling Stones, "Whish You Were Here" for Pink Floyd and "Highway To Hell" for AC/DC. For Blind Guardian it's different, the radio hasn't selected a recent song but rather something in the mid-90s, which isn't bad because the group has released very good albums during this period (Imaginations From The Other Side and Nightfall In Middle-Earth for example, which are in the 100 Greatest Metal Albums Of All Time according to Metal Hammer) but what is more surprising is that they chose a bonus track from The Forgotten Tales, so if you listen WDR 2 and somebody announces Blind Guardian, don't be surprised if you hear their cover of Uriah Heep "The Wizard". The first dates of 2010 advertised? The first dates of 2010 advertised? Apparently yes! Although the album is not out yet and we have also not yet a final release date, it appears that the dates are already scheduled for November 2010 in Spain. 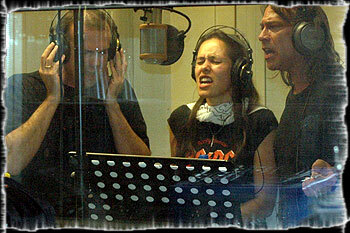 The group should play November 5, 2010 in Madrid and November 6, 2010 in Barcelona. The news was announced by the Spanish site Rafabasa but not yet confirmed on the official site. The dates are yet available on the tours page of the site. European tour dates for 2010 ! A week ago two dates in Spain were announced, today that the first dates of world tour 2010 / 2011 are confirmed by the official site and earlier in the night by Nuclear Blast. The dates are announced for Europe yet! The tickets for the German shows will go on sale December 9th at 12:00. And for all you early buyers there is a special X-Mas deal for the German shows: a reduced price of 30 EUR per ticket when you purchase them before January 10th from Metal-Tix or Eventim. A limited number of Hard-Tix for the German shows are also available. The opening band of these concerts will be Steelwing and another special guest will be announced soon! 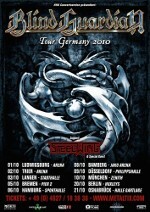 You can find all the dates on the tours page of en.Blind-Guardian.fr. While the dates of the next European tour are officially confirmed (others in Sweden and Poland are to be confirmed though), Nuclear Blast diffuse discreetly in the news of these tour dates the release date of the successor of "A Twist In The Myth", which shall then be released September 4th, 2010, 4 years day-to-day after the release of their latest album. I remind all those who want to go see the band in Germany next autumn they will pay their ticket 30 EUR instead of the 35.25 usual on metal-Tix until January 10 next, for the links directly to these places, go to the topic of the tour 2010 / 2011 on the forum. On the site, we remember that you can follow all the news of it by subscribing to our Twitter page and by joining the Facebook group. And finally, here's what Hansi had promised in his last news (Some news about the upcoming album: Frederik's set): a small series of photos of their work commented by Hansi: Christmas 2009 with Blind Guardian. The en.Blind Guardian.fr team wish you all a happy new year 2010! We hope it will be rich and happy for you all! And of course we also hope it will be productive for our favorite band! We already know that a new album, with a single, will be released and will be followed by a European tour (dates are available on the topic of the tour 2010 / 2011 on the forum with links to tickets where they are available for purchase). Three dates, two in Sweden and one in Poland, are still to be confirmed, however, and of course others will follow, those announced are just the beginning of this tour! Obviously we will certainly make you know any new confirmed date and the sale of tickets for these.